I’m sharing this apple salad recipe today in honor of my mom. As a girl growing up, I remember her making a version of this and it was always such a treat. My mom isn’t well and my dad is her main care giver. He is the chief cook now which is a total role reversal for them. This is actually his apple salad recipe. When my mom first began showing signs of dementia, he started spending time in the kitchen with her learning how to make their favorite dishes. Over the years he has simplified them to make things easier, as is the case with this apple salad. It has the freshest taste…especially in the fall when the apples are at their peak. Place apples, celery and walnuts in a bowl. In a separate bowl stir mayonnaise and sugar until smooth. 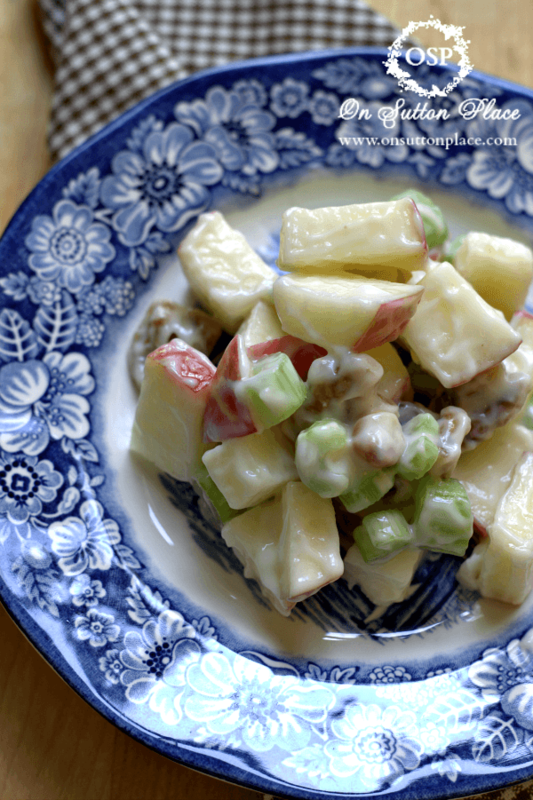 Pour mayonnaise over apples/celery/walnuts and mix well. A few of you have asked about my mom’s health since her heart attack and I am so happy to tell you that she is just fine. In fact, you would never know anything happened. Thankfully she doesn’t remember a thing. She is slowly getting her strength back and things seem to be running smoothly. At least for now. The weather broke in Ohio yesterday and there is a stunning weather report for this week. I am going to take some time and work outside. Not sure when I’ll be back. I am thankful for each and everyone of you. You are simply the best. Yummy, and I bought several honeycrips apples yesterday. I love them! Hello. You make me hungry. LOL. Looks so yummy. Crisp, fresh and Good! Thank you Ann for sharing this recipe! Lots of memories of family gatherings where this salad was always enjoyed by all of us. Your blog is a favorite with me, because of your personal notes and sharing family members. Sending a prayer for your parents & you for continued good health. Thank you for your prayers and kind words! I’m sorry about your Mom’s health but glad she is recovering from heart attack. Your Dad is a real trooper I know. Thank you for the recipe, I can’t wait to try it. What a very thoughtful & practical love your father has shown for his wife. Thanks for sharing the very touching story behind the yummy apple salad recipe. Here in IL we are enjoying the most beautiful Fall weather ever–enjoy your time outside! Thank you for commenting…the weather here in the Midwest has truly been beautiful the past week or so. Hope you try the apple salad sometime! I grew up loving and eating this salad. We user pecans sometimes and do not add sugar. Ann, this is just the sweetest story about your dad learning some of your mother’s recipes and now making them for her. It’s been a long time since I’ve made apple salad but your post reminds me that I should make this again. When I was growing up, my mother made carrot salad a lot. Haven’t made that in years! Enjoy your time outside but don’t work too hard! Ann this looks so good. So very good. Thanks for sharing, I will have to give it a try. So, this is sorta-kinda-in-a-way like chikenless chicken salad? Sounds absolutely great! I’m going to try it with apples I just bought from the Piggly Wiggly today. We don’t have apples growing here, so I grab them wherever I can. Spotted the Liberty Blue china pattern right away. Love it and collect it myself! Best wishes to your Mom – and I’m a new follower of yours! Thanks for following! You know…I think you are right about chicken-less chicken salad! I bet adding chicken to this would be amazing. Especially rotisserie chicken. Thanks for the idea and comment! Ann, this made me so happy when I read it! How great your Father knew to “cash” in on what your Mother fixed! No greater love than this! Just plain “sweet”. Thank you for sharing …. 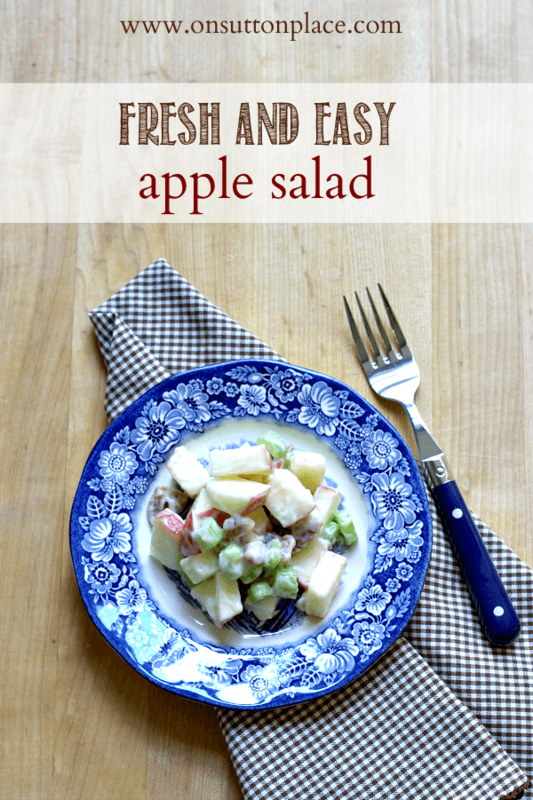 it brings back memories of the apple salad my Mother used to make … just like this one. Thank you. Your comment brought tears to my eyes…thank you so much. It’s funny how a simple apple salad recipe can bring back so many good memories…but it does! YUMMY, Ann! Aren’t family recipes the very best! Thanks for sharing this beautiful apple salad! Pinning! Ann, I don’t think I heard about your mother having a heart attack. I’m sorry you and your dad have been through so much. I know what a stress it is to have a parent with dementia and you are blessed to have your dad still with you as a caregiver for your mom. This recipe sounds very good so I think I’ll copy it down. Thanks for sharing it and enjoy the beautiful weather and your gardening. I so forget about making these types of salads…now that the apples are so wonderful and plentiful now…I will be making this refreshing salad…thanks Ann! Your Dad sounds like a real sweet heart! Oh pecans would be fabulous…I may have to try that the next time…thank you so much! I know this as Waldorg Salad and have loved eating it all my life. We add raisins sometimes also. My husband has been my caregiver this year due to a knee replacement followed by a staph infection. I’ve had two surgeries so far and will have a third one tomorrow to totally remove the replacement and put in medicated spacers. Once the infection is gone, I’ll have a fourth surgery to do a new replacement. He has been wonderful with the housework and cooking all summer long (and now fall and winter coming up). I am looking forward to getting back into the kitchen at some point. I think it is wonderful that your dad took the time to learn the recipes and is looking after your mom. I hope she continues to improve from her heart problems. Bless your heart and also your husband’s. I hope things are going better and that you will be back in the kitchen in time for the holidays. My mom is doing really well. Thanks for visiting and taking the time to leave a comment! MY MOM ALWAYS MADE THIS TOO BUT SHE ADDED CINNAMON. DON’T KNOW HOW MUCH SHE JUST PUT SOME IN. LOVED IT THANKS FOR THE REMINDER OF DAYS GONE BY. Beautiful place setting, love the dishes as well as a great looking recipe ! I’m sorry I haven’t kept up with you better. I didn’t know your mom had a heart attack, but I’m so glad to hear she’s doing fine now. My mom also used to fix this apple salad for my dad. (She called it Waldorf salad.) I never cared for it, but now I’ll eat it because it reminds me of her. Your dad has the same role that my dad did. Isn’t it a blessing to see him uphold his wedding vows and care for your mom the way she had cared for him before? Oh don’t you ever apologize for not keeping up. It’s so hard and sometimes life just happens. My parents are truly a blessing to me and to each other. Without my mom, I’m not sure what my dad’s purpose in life would be. I’m sure he could find something but right now his identity is as her care-giver. 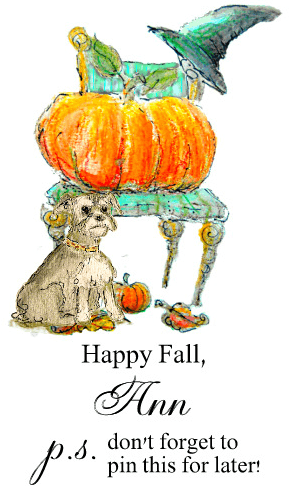 Hope you are enjoying autumn and best wishes for a lovely Fall! Your dads recipe sounds wonderful and very simple. Thanks Ann for the recipe. Your dad sounds like a wonderful man, his job is not an easy one. It is so wonderful to hear of a man who loves his wife, for better or for WORSE. We live in such a selfish world, it’s nice to hear of someone who has fallen in that trap. I’m glad to hear that your mom is fine, too.